New data from Europe’s Planck satellite challenges our understanding of the Universe, suggesting that Universe may be different on scales larger than those we can directly observe. Most accurate values yet for the ingredients of the Universe, with normal matter contributing just 4.9% of the mass/energy density of the Universe and dark matter making up 26.8% – nearly a fifth more than the previous estimate. Europe’s Planck satellite – a flagship mission for the UK Space Agency – has compiled the most detailed map ever created of the cosmic microwave background (the relic radiation from the Big Bang). The new map refines our understanding of the Universe’s composition and evolution, and unveils new features that could challenge the foundations of our current understanding of its evolution. The image is based on the initial 15.5 months of data from Planck and is the mission’s first all-sky picture of the oldest light in our Universe, imprinted on the sky when it was just 380,000 years old. This cosmic microwave background (CMB) shows tiny temperature fluctuations that correspond to regions of slightly different densities at very early times, representing the seeds of all future structure: the stars and galaxies of today. Overall, the information extracted from Planck’s new map provides an excellent confirmation of the standard model of cosmology at an unprecedented accuracy, setting a new benchmark for our knowledge of the contents of the Universe. 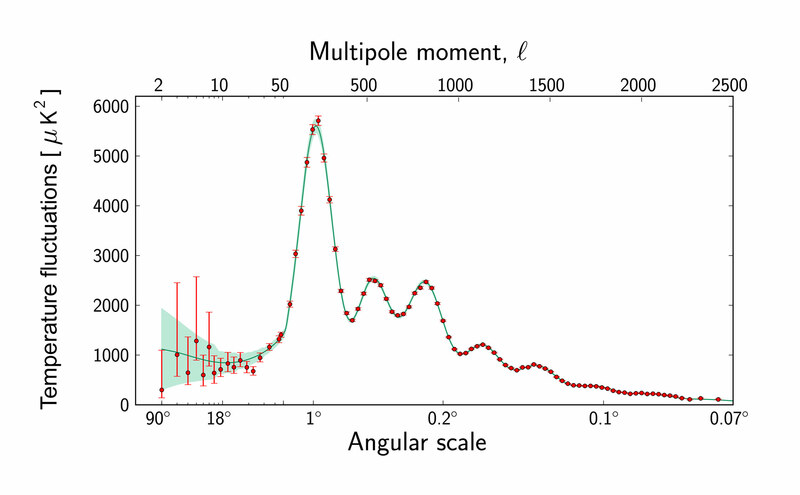 This graph shows the temperature fluctuations in the Cosmic Microwave Background detected by Planck at different angular scales on the sky. This curve is known as the power spectrum. The largest angular scales, starting at angles of ninety degrees, are shown on the left side of the graph, whereas smaller and smaller scales are shown towards the right. For comparison, the diameter of the full Moon in the sky measures about half a degree. The multipole moments corresponding to the various angular scales are indicated at the top of the graph. The red dots correspond to measurements made with Planck; these are shown with error bars that account for measurement errors as well as for an estimate of the uncertainty that is due to the limited number of points in the sky at which it is possible to perform measurements. This so-called cosmic variance is an unavoidable effect that becomes most significant at larger angular scales. The green curve shown in the graph represents the best fit of the ‘standard model of cosmology’ – currently the most widely accepted scenario for the origin and evolution of the Universe – to the Planck data. The pale green area around the curve shows the predictions of all the variations of the standard model that best agree with the data. “The CMB temperature fluctuations detected by Planck confirm once more that the relatively simple picture provided by the standard model is an amazingly good description of the Universe,” explains George Efstathiou of the University of Cambridge, UK. The analysis also gives strong support for theories of “inflation”, a very brief but crucial early phase during the first tiny fraction of a second of the Universe’s existence. As well as explaining many properties of the Universe as a whole, this initial expansion caused the ripples in the CMB that we see today. 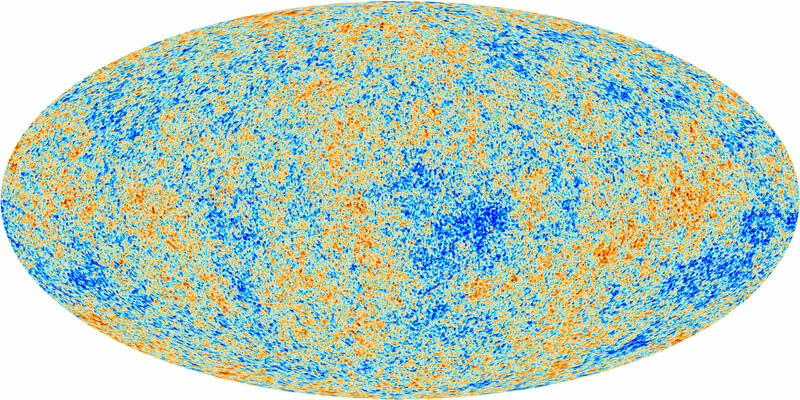 Although this primordial epoch can’t be observed directly, the theory predicts a set of very subtle imprints on the CMB map. Previous experiments have not been able to confidently detect these subtle imprints, but the high resolution of Planck’s map confirms that the tiny variations in the density of the early Universe match those predicted by inflation. “The sizes of these tiny ripples hold the key to what happened in that first trillionth of a trillionth of a second. Planck has given us striking new evidence that indicates they were created during this incredibly fast expansion, just after the Big Bang”, explained Joanna Dunkley of the University of Oxford. But because the precision of Planck’s map is so high, it also reveals some peculiar unexplained features that may well require new physics to be understood. Amongst the most surprising findings are that the fluctuations in the CMB over large scales do not match those predicted by the standard model. This anomaly adds to those observed by previous experiments, and confirmed by Planck, including an asymmetry in the average temperatures on opposite hemispheres of the sky, and a cold spot that extends over a patch of sky that is much larger than expected. Further information on the science results are available here. A series of scientific papers describing the new results have been submitted to the journal Astronomy and Astrophysics. The preprints can be accessed here. Background information to the topics discussed in this release – the Cosmic Microwave Background and the history of structure formation in the Universe – is available here. The new data from Planck and the cosmological results based on them have been presented at a media briefing organised by the European Space Agency at Headquarters in Paris, on 21 March 2013, 10:00-12:00 CET. A reply of the briefing is available here. Further results were discussed at a science briefing on 21 March 2013, 14:00-15:45 CET. 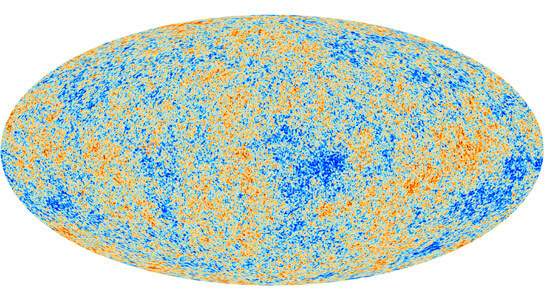 19 Comments on "New Planck Data Challenges Our Understanding of the Universe"
I have one question about this map. But first the story was nice to read and full of facts to sit back and think about. Okay my question is with this MAP of the universe it has Earth at the centre or can only be made with Earth at the centre, with are point of view. So the map has to either be in error to the Big Bang theory or in favor of the God theory. If we were to travel out 500 million light years in any direction and do the same set of test, we would in turn come out with the same map. That is to say if the Big Bang theory is correct, seeing we do`not know where it happened only that it did. If this is true then the age of the universe can not be counted as being correct with no real point to start at. First we need to find the point of origin of the Big Bang and count out from there. For if and when it happened we would not be in the centre but on the move out . The Big Bang didnt happen somewhere, it happened everywhere. Hi, Mark Sinus! Hope you are well! Hope you don’t mind me suggesting it but, it is my view your comments are complete nonsense! Where on Earth did you get the idea of; ‘multilayer structures with fundamentally different physical properties from?’ – You’ve been reading ‘Marvel’ comic books, Haven’t you?’ I reckon you must be so steeped in the current dogma you would find it exceedingly uncomfortable to step outside of the tenets and ‘THINK FOR YOURSELF!’. I don’t expect every science writer to be a scientist or mathematician but a little fact checking would be nice. This story says we have normal matter at 4.9% plus dark matter at 26.8% plus dark energy at 69% which puts us over 100% before we even include normal energy. The Universe is not expanding, if anything the red shift indicates a contraction! The higher red shift indicates stronger centripetal force. The so-called mysterious Dark Energy is the Momentum Energy, cP = cmV. This is the vector energy associated with every spec of matter that is moving and having a momentum vector. cP = mcV is much larger than vp = mGM/r = mv2 the scalar potential energy. The Energy of the Universe is W = -mGM/r + cmV = -vh/r + cP. The Hubble Constant is 60 km/s/Mpc and the Universe is around 16.3 Gy. Hi, Wardell! I find it interesting that you make reference to, ‘EXPANSION’ rather than ‘Inflation’? You appear to have an excellent grasp of mathematical/scientific equation which suggests to me that you were educated within the dogmatic arena however, I have found that the terminology ‘Expansion’ does NOT sit well within either of the disciplines in question. I also find it interesting that you again step outside the dogmatic arena in your use of the terminology; (so-called mysterious Dark Energy). You do realise that such is held as sacrilege among the scientific community? Our universe is made entirely of ‘Electromagnetic Energy’ under the weight/heat and pressure of our entire universe, a single strand of Infinity snapped and then broke down into the smallest divisible pieces and formed into Protons and Neutrons. Gravity, isn’t ‘Gravity’ per se but the natural affinity held within electromagnetic energy to attract or repel according to polarity. Protons formed first which attracted all of the smallest reductions making then positively charged and Neutrons formed second when all of the much smaller charged particles had been used up, leaving Neutrons to form ‘Neutral’. the latter, under pressure then formed into atomic structures; ‘Heaviest element, ‘Oconnorium’ first’ ‘Lightest'(H160 Hydrogen) last. At the point of ‘Criticality our universe exploded and sent out all of the elements as we recognise them today. (With all of the Heaviest elements trapped at the centres of the largest pieces, (Spiral galaxies) which emit throughout their journey outwards from the, ‘Bang’! Now, doesn’t the latter explanation lend itself much more appropriately to math than the nonsense that is in situ at the moment? C. Peter, thanks for your comments. I agree with much of what you say, the Universe is electromagnetic energy. Gravity energy is large scale aggregate of electromagnetic energy (mass). Gravity defines the structure of the Universe. The size and energy is defined by mass. where cP is the electron vector energy. The velocity of the electron is v= Z alpha c where Z is the atomic Number and Alpha is the Fine Structure Constant and c is the speed of light. and v=c at Boundary. For Atoms v= ZAlpha c=c thus ZAlpha = 1 this implies that Z is less than 1/Alpha = 1/7.2E-3 = 138,8888. Here we see that atoms cannot have nuclear charge higher than 138. The Fine Structure Constant is e2z/2h where z is the Free Space Impedance. The Free Space impedance is the resistance in space for electromagnetic waves, Maxwell’s Aether. z= 374 Ohms = W/Q and Planck’s Constant h=WQ. Here we have two Quantum Constants and two unknowns, this gives h=zQ2 and q= 4/3 E-18 Coulombs and W=500E-18 Webers (Volt seconds). The Free space is filed with electric and magnetic charge, Q and W.
The Fine Structure Constant is 1/2 (e/Q)^2 = 1/2 (.16/4/3)^2= 1/2 (.48/4)^2 = .5(.12)^2= .5(.0144)= 7.2E-3. Q = 4/3E-18 Coul = 25/3 e = (13U,1d) Quark = (13(2/3) 1(-1/3)). The Universe has multilayer structures with fundamentally different physical properties. Within all of the dogma that has arisen throughout the last century in particular there is not a single instance where someone has ‘Logically’ described how our universe was created and perhaps more importantly, ‘From What’! It is simply illogical to the point of inanity to suggest our universe was created from a, ‘Singularity’ because, in the first instance such supposition will always generate the questions; ‘What came, ‘BEFORE’ the, ‘Singularity’ to generate the impetus ‘For’ the Singularity? Furthermore, even the concept of ‘Infinite density’ goes against every ‘Scientific Law’ we hold dear because, it relies on the precept that either our entire universe was once crammed into a space the size of a, Proton or, additional energy was created after the, ‘Bang’ and given the fact that ‘Energy’ cannot be, ‘Made’, that single fact blows a very ‘Large Hole’ in the current dogma. Logically, the only way our universe could have come into existence is if there was a source of energy present ‘Before the, BANG’. CAPABLE OF TICKING ALL OF THE BOXES (so-to-speak) is if our entire universe is made from, ‘VOID ENERGY’ (INFINITY) which in turn has to be; ‘ELECTROMAGNETIC ENERGY’. I deposited my various postulations on the creation of our universe with the academia of the world in June 2011 and the, ‘Americans’ (including their President) didn’t have the common decency to acknowledge receipt of my gifts. Not one of those involved in the conspiracy could possibly claim to be either an ‘Academic’ or a ‘Professional’. No, it does not have to be electromagnetic energy, it just has to be self-expanding “energy”. Self-expansion is the only property the universe needs. With anything that self-expands, as in creates more of itself, it immediately creates the fundamental differentiation required for relativity and it creates the energy for causality to occur. It requires no first cause, being The Cause, and thus is infinite in a pre-existing sense, a future sense and a hierarchical universe sense. Fundamental differentiation – newest is “bigger” than not than what is the preceding newest, but not bigger than all that precedes newest. This is the core differentiation, lacking the introduction of division. Expansion – Not describable as it is too fundamental, however I use the term Time to refer to this affect. Time is observed to run at a set but relative rate. Time must pre-exist and permanently exist for change to occur. Causality is meaningless without the assumption of time. Time is a sort of physical nothingness, which a singular property thingness would also be until the inclusion of relativity. Energy = expansion + pressure. Flow – Where energy is less bounded then that is where it will shift to equalise internal pressure. Division – As what is not newest is also expanding, that expansion is bound by what is newer, ad infinitum. This creates internal pressure that builds up over time, until eventually the internal expansionary “energy”, exceeds that of it’s “shell”, the shell only being that expansion that is newer. This is the Big Bang effect – one that happens constantly on different scales. This fracturing of the shell causes “energy” whirls, where it has changed from a uniform pattern of differentiation to a mixed pattern of energy flow. Space – A mixed energy flow is a change from a 3 dimensional expansionary sphere to a more flattened 2 dimensional existence and as a result creates planes of existence. Space is the totality of these planes. Relativity – Expansion always results first is the growing out from a centre in all directions. It is spherical and has a floating centre, not of gravity, but of the brick wall caused by internal expansion. It is unable to expand into that centre it can only expand outwards and around the centre (causing spin, once in a relative state). Once the shell is fractured, then that becomes a second level of differentiation and a division from what is not in a fractured state. This has always existed so relativity has always existed – there was always a past that was lesser than now. Evolution (of matter) – the result of the above. People view the universe incorrectly. The universe grows from the outside in, as well as the inside out. Science sees everything as growing from the inside out (ie a big bang). Atoms, black holes etc are regressions from the present – they do not grow from inside via quantum strings and gravity, they merely recede observationally from the present as in a russian doll scenario. View galaxies as whirlpools – it is the ocean that creates the whirlpool. The first cause is a continuous cause. All everything is is time creating more of itself from itself alone. Galaxies are expanding away from each other only because in the relatively empty spaces between galaxies, time’s expansion is less bound (less relativity, less equalisation, less static) than for things of matter such as suns and planets. hUBBLE IS THE kEPLAR OF OUT TIME. He is clear and convincing. It is time to set aside General Relativity and adopt Quaternion Physics. and a vector Momentum energy cmV= cP. Current Physics does not consider vector energy, thus the vector Momentum Energy cP, is hidden in plain sight. This Momentum vector energy is the so-called “Dark Energy” and its Divergence is the centrifugal force that is responsible for preventing gravitational Collapse. the earth falling into the sun and the electrons galling into the nucleus! Hubble.s data and analysis has established the reasonableness of no recession. Quaternion Physics provides the Theory that supports this data and conclusion. THIS CONFIRMS THE SCIENTIFIC FINDINGS AS THE RESULT OF WHICH THE ADOPTED PARADIGM OF PHYSICS HAS BEEN OPENLY CHALLENGED. LET EVERY STUDENT & FACULTY OF EVERY UNIVERSITY KNOW ABOUT FOLLOWING OPEN CHALLENGE TO ADOPTED PARADIGM OF PHYSICS. You could see it at worldsci.org/php/index.php?tab0=Abstracts&tab1=Display&id=6476&tab=2 and gsjournal.net/Science-Journals/Essays/View/4018. The article ‘On the Electrodynamics of Moving Bodies’ by Albert Einstein is based on trickeries is proved beyond any doubt whatsoever in the articles (1). Experimental & Theoretical Evidences of Fallacy of Space-time Concept and Actual State of Existence of the Physical Universe published in the peer-reviewed journal namely Indian Journal of Science & Technology (March 2012 issue) available on indjst.org (2) On the Electrodynamics of Moving Bodies By Albert Einstein is Based on Trickeries (Open letter to Professors, Teachers, Researchers and Students of Physics) published in peer-reviewed journal Elixir Online Journal (February 2012 issue) available on elixirjournal.org. The Voigt transformation was simply a mathematical possibility which was changed by Lorentz by introducing the Lorentz factor but the Lorentz factor is simply a manipulation. Thus nature and forces in nature were trivialized and made subservient to mathematics in the theories of relativity, Big Bang Theory, Space-time concept and in all physical sciences which are directly or indirectly based on the ‘On the Electrodynamics of Moving Bodies’. It is unfortunate for humanity that exposing these trickeries took more than one hundred years. I agree with James Hayes in reply to Wardell and Peter O Connor, by correctly explaining that energy need not be only electromagnetic in nature. He is like a blind man touching only the trunk of the elephant and saying that it is like a pillar and another one touching the body and saying that it is like a wall. There are other form of energies also like electro-weak energy, mediated by Z and W+, W- Bosons, and then strong forces mediated by color forces Red, Blue and Green gluons in the quarks. Gravitation is not mediated by electromagnetic photons as stated by him, but by another exotic force particle. For a moment I was astonished to find his analysis and thought that he will be getting the next Nobel prize for his great discovery. The loss of momentum of a moving particle in matter media invokes heat energy and it is how it is expended and that it goes to increase the entropy of the Universe. The concept of Dark Matter came only after observing kaleidoscopic galaxies under the influence of lens effect of some mysterious very massive invisible matter or energy by sheer gravitation to split the light under its gravitational force. They have only the gravitational wing of the force and not electromagnetic force. Otherwise the photons would be emitted to make them glow. There are no energy splashes in the dark matter ensemble. Further the gravitational displacement of galaxies at a fantastic speed speaks of their proportion in the Universe. One friend is doing school arithmetic to say that total of Matter, Dark Matter and Dark energy exceeds slightly 100%. Does he not know that percentages are given by approximate strength only and they don`t do the counting of apples in a basket? Hamiltonian and Lagrangian in classical dynamics refer to potential and kinetic energy only and they cannot be extrapolated to quantum states. In the case of falling meteors the zero potential as long they are drawn towards any gravitating planet, gains the potential energy which was the transformation of the gravitational energy only. This potential energy as it falls into the potential well gives out its kinetic energy into heat energy by burning and then getting the potential energy reduced to zero once it touches the ground. Thus the currency of exchange of energy is well preserved and it will never go to form any Dark Energy as stated? Thank You. Your obvious ignorance of physics is not an excuse for conspiracy theories and ignorant conjecture about the science. Philosophy is not a hard science, so using it in the same sentence with physics is ludicrous. I spend a good part of my day every day attempting to educate pseudo scientists like you who probably never made it past a high school education and think that by reading a few disreputable articles that you are suddenly a physics professor. It takes about twenty years of college to acquire a Ph.D and a Masters degree in physics as I have done. Your comments disparage the unshaken dedication of all the people who have selfishly devoted their lives to knowledge and science. Nobody NEEDS to prove you wrong or accept your ignorant conjecture. The amount of evidence and information on this is irrefutable. You have no idea what you are talking about. There are no “trickeries” in science. And based on your comment, we have no need to waste our time with you, as it would take a lot of instruction just to get you to a level of understanding where we could have an intelligent conversation on the subject. For the detailed reply you may read the link https://www.linkedin.com/pulse/adopted-paradigm-physics-incorrect-shafiq-khan?trk=prof-post. I would like to keep you informed that the open challenge has been sent to almost all professors of physics & universities of the world and so far two retired professors of physics namely Jeremy Dunning-Davies of Hull University & Brian Cole of Columbia University accepted the challenge but both of them finally failed to show a single error in the papers on the basis of which open challenge was put forward. In this regard exchange of articles between me & Jeremy Dunning-Davies are available on vixra, General Science Journal & Elixir Online Journal. Now almost every concerned physicist of the world is in total knowledge of the standing open challenge and they also know that they can do nothing about it technically & scientifically. They would have easily accepted the alternative paradigm of physics which emerges as the consequence of my scientific publications but that would reduce their degrees to trash and they will morally have to quit their jobs. Besides there is fund flow of huge public resources annually for research to different research institutions including the research institutions all over the world and once world comes to know that all these institutions are knowingly wasting public money for baseless research millions of heads would have to roll. Thus all the main-stream physicists are maintaining a deliberate silence and ignorance of the standing open challenge.